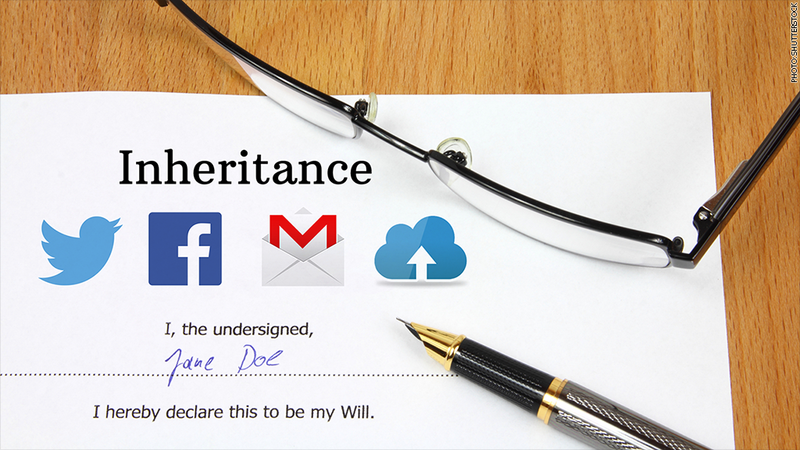 In Delaware, heirs can now inherit the online accounts of someone who passes away. When people die, it often means the end of their online identity as well. But this month, Delaware became the first state to pass a broad law giving heirs the right to access online accounts and digital assets of someone who has passed away. Under the new law, which went into effect last week, the executor of the estate has access to their "digital assets such as email, cloud storage, social media accounts, health records, content licenses, databases and more," according to a statement from the Delaware House Democrats. While this statewide mandate is the first of its kind, several other states have been taking steps in this direction as well, introducing limited laws. Connecticut and Rhode Island give executors access to email accounts of the deceased, for example. Some national companies, like Google (GOOG), already offer the option of a beneficiary to all users -- no matter where they live. With Google's Gmail, users can assign a beneficiary, and if the account is inactive for a pre-determined period, they will be contacted by Google. If there's no response, the beneficiary will be able to log into the account -- whether to dig up important emails or just to shut down the account. Users can even set an auto-reply message that will be sent out to friends after their death. Without a beneficiary, heirs could be in for a long and complicated battle to retrieve the accounts -- and in many cases may never gain access to them. Related: Can you inherit your dead parent's debts? "If you need access to the Gmail account content of an individual who has passed away, in rare cases we may be able to provide the contents of the Gmail account to an authorized representative of the deceased person," Google says on its support page. The process, which could take months, involves sending personal information about the deceased person and a death certificate, among other things. Twitter (TWTR), meanwhile, allows an executor or someone who can be verified as an immediate family member to deactivate an account -- but a death certificate, along with other information, must also be sent. But if other states follow in Delaware's footsteps, more family members and friends no longer have to navigate the patchwork of corporate rules in the wake of a loved one's death. "As we conduct more of our professional and personal business online, we must also change our laws to match the reality of how people live in the 21st Century," Delaware Governor Jack Markell said in a statement. Not everyone agrees, however. Jim Halpert, who works at law firm DLA Piper and is general counsel to State Privacy and Security Coalition, which represents companies like Google, Facebook (FB) and Yahoo (YAHOF), said Delaware's new law goes too far. He said it violates the privacy of both the deceased and any third parties whose personal information could be revealed through inherited online accounts. "There could be pretty confidential information in those accounts," said Halpert. "The law provides maximum convenience to the executor to an estate without regard to the privacy interests of people who communicated with the person who passes away."